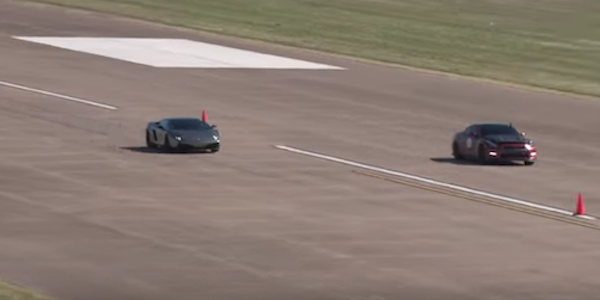 Watch a Nissan GT-R take on the Lamborghini Gallardo and win. Not just once but three times. This Nissan GT-R takes on the Lamborghini Gallardo at the Texas Invitational event last fall. It’s so quick it beats the twin-turbo V10 Lambo three times. The GT-R’s V6 is heavily modified and pumps out 1400hp. The twin-turbo V6 under the hood of the Nissan has been stroked which takes the factory displacement 3.8-liter to a 4.1-liter setup. To get the 1400hp, it gets a pair of 86mm turbos, which allows the driver to play with all that extra horsepower. The turbochargers deliver 40 psi of boost in the setup seen here. Watch Ali blow away the Lambo not once, or twice, but three times. The boosted Nissan GT-R supercar is engaging in half-mile battles with the Lambo here using a rolling start. The trap speed being important, the cars competed in the 175 category. The GT-R is impressive without all the modifications. With them, it’s unbeatable. The stock 2016 Nissan GT-R is impressive with the 3.8-liter twin-turbo V6 putting out 545 horsepower and is built to perform. Ali takes the Nissan GT-R and ramps up the grin factor to another level. Ali says, “I love it.” We can see why.